Exotic wood from a pallet? The six sided table is unique, but it is the wood that steals the show. Beautiful peach tones are surrounded by blonde wood from the same tree. 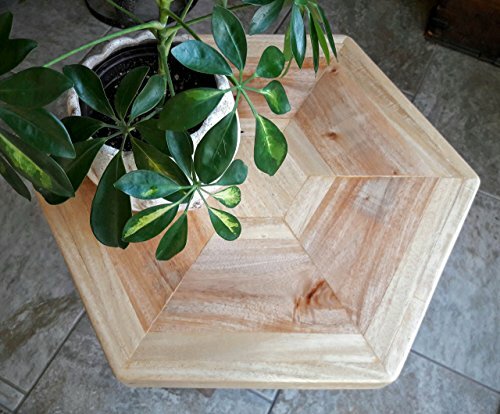 The center of the table is made of a single 6-sided piece of wood. From looking at the varying colors of the wood and researching, the type of wood is most likely African Mahogany, also known as "Khaya". The colors vary from a white sapwood to a darker brown color and this beautiful shade of light pinky-peach. The special thing about this wood is the light-refracting optical phenomenon known as chatoyancy. It lights up from certain angles giving it a three-dimensional appearance. The top is finished with a satin polyurethane that stands up well to moisture. The sturdy base of the table, is a simple "X" pattern made of pine and stained in a coordinating shade of American Walnut. It was assembled with concealed pocket hole joinery. Table top is 15" across on the parallel sides and 17" from point to point.